Ever since my post about running my business from a web browser, I’ve been getting comments and emails about security. In addition to using cloud powered apps to run my online business, I store my files on Dropbox so I can have access to them from any computer. The security concerns people have about running their online business from the cloud are legit. Therefore, I’ve decided to do a post on the number 1 way to protect yourself online and that is to make sure no one can figure out your passwords. It’s a sad fact that the most powerful thing standing between a hacker and your information is the most overlooked – the password. Too many people use the same password for everything and their passwords are so weak, a hacker can break through it in a matter of minutes. How weak is your password? Take the MS Password Strength Tester and find out. I have over 100 sites that I have online access to. That means I have over 100 different passwords. These passwords range from 15 to 50 characters in length, having upper and lower case, letters, symbols, numbers and don’t form any real words. How do I remember all those passwords? I don’t. Instead, an awesome piece of software call 1Password does it for me. If you’re like me and run more than one computer (plus an iPhone), keeping all the passwords synced can be a problem. While 1Password does have an import and export feature, I’ve found the best thing to do is to combine 1Password with Dropbox. By moving the 1Password.agilekeychain file to my Dropbox, it becomes usable to the 1Password programs installed on my other Macs. All you need to do is go to the 1Password Preferences and under the General tab, click Move on the Data File. Select Dropbox as your new 1Password.agilekeychain location and you’re set. Now install 1Password on the other Macs. 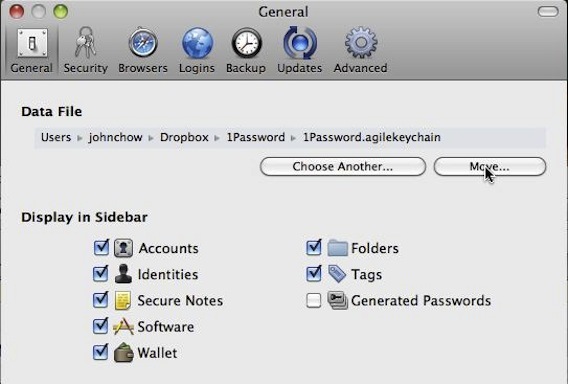 Go to the shared Dropbox and double click on the 1Password.agilekeychain file. 1Password will ask if you wish to use this file. Click yes and you’re done. Now, any updates to the password files from any computer will auto update all the other computers. Your passwords will always be synced. If you’re on a public computer and need access to your passwords, then you’ll love the 1PasswordAnywhere feature. Just save the 1Password.agilekeychain onto a flash drive and you’ll able to access all your passwords from any comp you have the flash drive plugged into. If you save the 1Password.agilekeychain file in your Dropbox like I do, then you can access it from any computer in the world by logging into Dropbox.com. Because passwords are entered using copy and paste, keyloggers can’t record them. This provides an extra layer of security when working from a public comp. Sounds Great But What About The Poor PC People? While Dropbox will work with PCs and Macs, 1Password is a Mac only program. PC users looking to duplicate the same user experience can look at Roboform. Roboform does most of the same stuff that 1Password does but you can’t sync it using Dropbox. Instead, you have to use the Roboform Online service. Creating an account is free but I think using it cost money. Roboform is not as eloquent or as pretty as 1Password but it should get the job done for the poor deprived PC users.